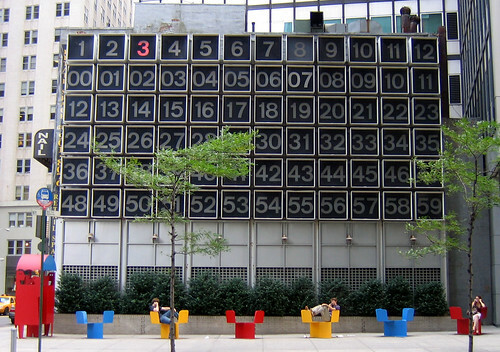 World's largest grid clock and perhaps only one of its kind, can be found adjacent to 200 Water Street (formerly known as 127 John Street) New York. Designed by artist Rudolph de Harak (who also designed the Giant Chess Board) at the behest of the Kaufman brothers, who were also responsible for 767 Third Avenue (Giant Chess Board) and 77 Water Street (Sopwith Camel WW-1 plane on the roof). The giant clock has 12 panels in the top row to indicates the hours. Below it are 5 rows of 12 panels each to indicate both minutes and the seconds. The time is displayed by illumination behind each panel. The numeric panels are displayed in different colours to differentiate between the hour, minute and second. 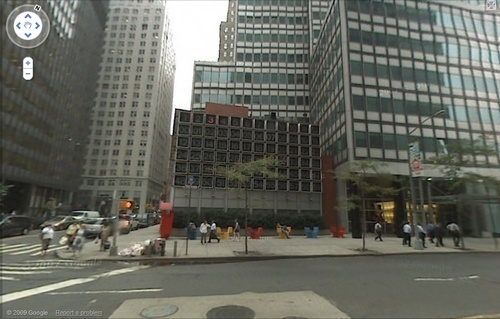 The 32-storey property built in 1971 was originally developed by Kaufmann brothers as an office building. Later it was converted for residential use and served as dormitory for New York University. A few years back it was acquired and managed by Rockrose Development Corp. who have converted it in luxury rental residential building. The Giant Clock which had fell in disuse has also been repaired and is functional again. The side walk below the clock is adorned with colourful benches and a dummy telephone booth. Note: Several web sites have mentioned this clock as Digital Clock and few including the official webpage have termed it as "Grid Clock", I have therefore used the later name. I couldn't find any reference on the Web as to how it functions. My presumption is that some sort of motorised clockwork mechanism sequentially triggers switches which in turn lights the bulb behind the individual numeric displays. I would welcome further information on the clock. Credits: I am thankful to Eddie Kilkenny who e-mailed me info about this giant unusual clock - Thank you Eddie.